Produce a report with a line chart about comparing the average and 2014 high temperatures using Excel and Word. Video #1 - Produce a line chart that will compares the average high temperatures with the year 2014 for each month using Excel. Video #2 - Write a report in Microsoft Word and insert the line chart at the bottom half of the report. What does the two lines compare in the chart? In 2014, which two months were the most different when compared to the average? 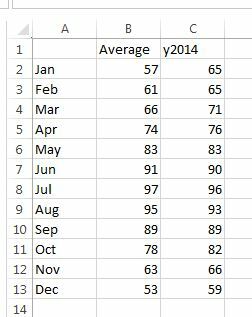 Do you think 2014 was very close to the average or much different in temperature when compared to the average? What do you like to do when it gets hot in the summer time?